For just over forty years – from c. 1680 to c. 1725 – piracy flourished in the Caribbean as at no other time. This was known as the “Golden Age of Piracy”. 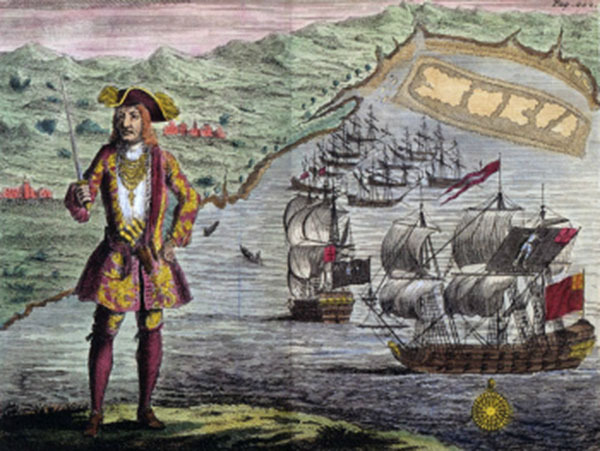 The Caribbean was the perfect place for piracy to flourish in the late 1600s. Thousands of islands and river inlets made for perfect hiding places. It was close to the routes of the Spanish treasure ships plying between mainland South America and Europe. There were also British and French colonies with their traffic of supply ships. Just to the north were the fledgling American colonies who welcomed any boosts to their growing economies. Piracy is considered to be the third oldest trade in the world – after prostitution and medicine. Very soon after Columbus stumbled upon the West Indies, men had begun supplementing their meagre income by robbing passing ships in the Caribbean. These people lived, mainly peaceably, on the island of Hispaniola – sometimes incorrectly called the Spanish Main – and subsisted mainly by making and selling, to passing ships, smoked wild pig products. This was prepared in a smoke-oven called a boucan – hence the term Boucanier, or Buccaneer. The Spanish attempts to drive them off the island by slaughtering all the pigs, forced them to turn to full-time piracy. For almost the entire 17th century Britain and France fought a succession of wars with Spain. Looting the Spanish treasure ships travelling between Europe and Spain’s South American and Caribbean colonies was considered a useful way to top up state coffers that had been depleted by years of conflict. It was expensive to equip warships to patrol the Caribbean sea-lanes in search of enemy merchant ships to board and seize, together with their contents. So the European countries opted for a cheaper method. They issued Letters of Marque to adventurers. These letters authorised the adventurers to capture and plunder enemies of the issuing country. Normally the adventurer would have to fund his own expedition – with maybe a small subsidy. He was expected to pay a substantial portion of his winnings to the sponsoring crown. Off they sailed to the Caribbean, where they plundered to their hearts’ content – all the while brandishing their Letters of Marque as justification. This practice was known as privateering. There is a very fine distinction between privateering and full-blown piracy, and it became quite common practice for privateer crews to turn pirate if no legitimate targets presented themselves. Once the line had been crossed, they were officially outlaws – welcome nowhere except in the lawless Bahamas Islands and other out-of -the way places. The wars against Spain ceased at the end of the 1680s. In addition to the thousands of naval crewmen who had been retrenched at the abrupt outbreak of peace, dozens of experienced privateeersmen suddenly had no legal means of income. Merchant traffic increased due to the peace, and their naval escorts decreased due to cost considerations. The temptation was too much, and piracy blossomed. Add to this that life for the average man at the time was extremely brutal – he could slave his entire life for less than $1.50 a week, be sent to prison for an unpaid debt of $0.02 and be hanged for the theft of a loaf of bread. Merchant and Naval seamen were better paid than their land-bound counterparts, but lashings and other savage punishments for minor infractions were, too often, the norm. The chance of making a fortune over a short period and then retiring to a life of ease in a remote place, had its attractions. Should a pirate be captured and the hangman’s noose beckon, what had a man lost? These were also the times when the seeds of the great Social Revolutions of the 18th century were beginning to be sown. It is no use having a hold full of plunder with no place to exchange it for gold. The pirates needed a market for the goods they had acquired. This was were Britain came, unwittingly, to the pirate’s – and the new American Colonies’ – aid. In the early 1650’s the British parliament had passed the first of a series of Navigation Acts to protect her trade with her colonies against foreign competition. These laws stipulated that that almost nothing could legally be brought into British ports – or those of her colonies – except by British ships manned by British sailors. The effect was to create a virtual monopoly for British traders, that began to strangle the colonies’ trade. Worst hit by these laws were the American Colonies. The relatively small British market could only swallow a fraction of the American colonies’ output. Alternative markets were needed to ensure financial independence. The North American ports were just a few days’ sail from the pirates’ Caribbean lairs. Pirate crews were only too happy to help smuggle Virginian tobacco for a guaranteed payment, and New York businessmen were glad to have a steady supply of luxury goods for their stores. It was the perfect arrangement. The pirates and Colonies thrived. Pirates were later to be driven out of the Caribbean and American waters by Governor Spotswood of Virginia, Captain Woodes-Rogers of the Royal Navy and others. But for a brief period they ruled the Caribbean.